U.S. companies with significant exposure to China have seen their stocks tumble since President Trump's opening salvo in the trade war. 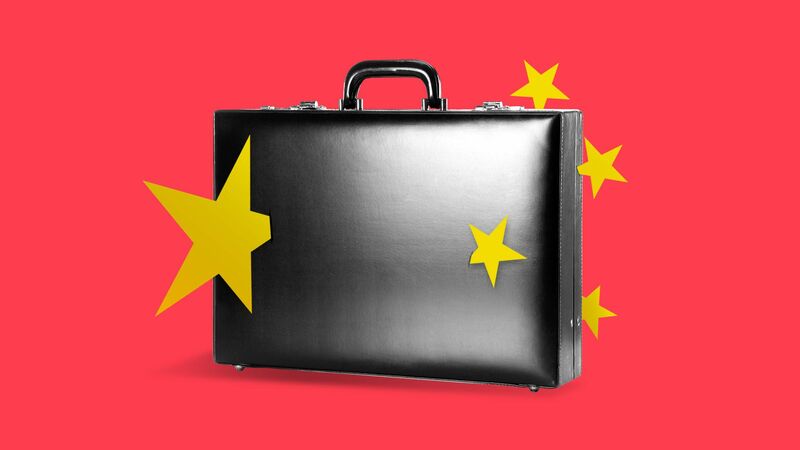 But it wasn't really China or the oft-invoked trade tensions that hurt those companies, Axios' Courtenay Brown writes. The big picture: Chipmakers like Skyworks, Qorvo, Qualcomm and Micron, along with Wynn Resorts, top the list of S&P 500 companies that make their biggest share of revenue in China, data compiled by Goldman Sachs shows. All of those stocks are deeply in the red since Trump took the first steps toward a full-blown trade war on Jan. 22. Shares of Advanced Micro Devices (AMD), which generates about 30% of its sales in China, jumped almost 60% since last year. Analysts say the rise is largely due to expectations AMD was taking market share from players like Intel. Qualcomm's stock suffered after its merger with Broadcom was killed by the Trump administration, as Axios reported last year. The 20 S&P 500 companies with the greatest share of revenue coming from China had a rough year in 2018. However, their stock movements during the year showed that more exposure to China didn't equate to bigger losses, and reduced exposure didn't necessarily help. 2. Venezuela: "A tremendous opportunity"
Investors hoping for the removal of Venezuelan President Nicolas Maduro may get more good news this week. The Trump administration signaled it may impose new sanctions against the country's oil sector — the lifeblood of Venezuela's economy and only major source of revenue. The news followed the announcement Wednesday the U.S. would recognize Juan Guaido, head of Venezuela's National Assembly, as the country's president, not Maduro. "If things change in Venezuela it would be a tremendous opportunity," Jan Dehn, head of research at Ashmore told me late last year. He predicted Venezuela's bonds could double in price if a new president takes office. The big picture: The country’s sovereign bond maturing in 2027 rose on Wednesday to its highest level since June. That’s notable considering the 2027 bond, and all but one of Venezuela’s other bonds, have been in default since November 2017. "There's a tremendous rally happening with the expectation that regime change leads to eventual restructuring of these bonds," said a fund manager from a major firm who asked not to be identified because he’s not permitted to discuss Venezuela’s debt. "The market is pricing in Maduro's exit as closer than we previously thought." What's next? The oil sanctions may be the final nail in the coffin of a leader who has presided over an economy expected to hit 10,000,000% inflation this year with a 90% poverty rate. My thought bubble: Maduro's ouster could be an inflection point in the country's history, but it will take a lot of work to turn what's effectively become a failing narco/petro-state into a functioning economy. Venezuela owes international creditors an estimated $150 billion. A new regime will need to come to terms with creditors in order to be given access to international credit markets again and start rebuilding. The country is producing oil at a 70-year low and analysts believe it could be three to five years before it is able to pump oil at its potential rate again. There would almost certainly need to be a bailout from the IMF, which hasn't even been allowed to enter the country in years. Simply assessing Venezuela's needs could take years and the economy could continue to falter even after an aid package is administered. From the World Economic Forum, the Washington Post's Heather Long reports there are serious grumblings among business leaders that China has taken the lead on artificial intelligence. Why it matters: "The Chinese government has made tech dominance a priority in its 'Made in China 2025' plan. Chinese leaders are pouring government money into AI research and development in a scientific push that has been compared to the space race or the Manhattan Project that the U.S. government funded during World War II to develop a nuclear weapon." The bigger picture: "There are concerns that the United States is falling behind, and executives might not even realize it." Strikingly, Brazilian President Jair Bolsonaro has been this year's foremost addition to the World Economic Forum's loftiest circles, Axios' Felix Salmon writes. The big picture: There has so far been little worry about his fondness for dictatorship, his plans to ravage the environment or threats to jail or exile political adversaries. Why it matters: Davos is a small town, where plutocrats and heads of state eddy around each other, each with their own gravitational attraction. Look to the very center of attention and fascination, and you will very frequently find a strongman president. In prior years, both Russian President Vladimir Putin and Trump have been feted by WEF head Klaus Schwab. This year belonged to Bolsonaro. Bolsonaro was seated at Schwab's top table on Tuesday, along with Tim Cook and Satya Nadella, the CEOs of two of the most valuable companies on the planet. Bolsonaro's Flickr feed is full of photo-ops with the likes of Japanese Prime Minister Shinzo Abe and former U.K. Prime Minister Tony Blair. If Bolsonaro was at all concerned that his far-right rhetoric would make him a persona non grata in Davos, his first day in town will have put all such worries to rest. Bolsonaro also gave a high-profile speech to the Davos crowd. Schwab introduced him by gushing that "Brazil is going, and will go, through a period of decisive transformation under your leadership." The bottom line: The WEF might be a high-minded nonprofit, but it runs on money and power, both of which are fundamentally amoral. After the Davos globalists embraced Trump in 2018, it comes as no surprise to see them doing the same with Bolsonaro. Social media was abuzz with rumors Wednesday that Maduro had been not only usurped of the presidency, but also stripped of his verified influencer status on Instagram. But, but, but: Business Insider news editor Rob Price says an Instagram spokesman told him Maduro was never verified on the platform. Editor's note: A friendly reader pointed out that Wednesday's newsletter incorrectly referenced the source of data on foreign buyers of U.S. Treasury notes. That data comes from the Treasury Department, not the CFTC.